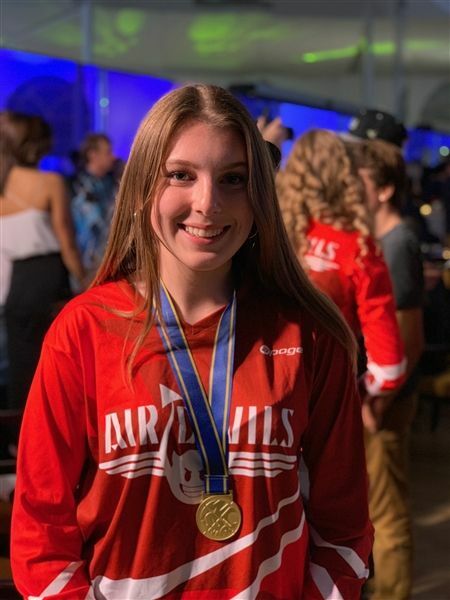 Congratulations to MAC's Grade 11 student Hope and her team for their Gold Medal win in the Junior 4-way Formation Style event at the Skydiving World Cup! Hope's team of four (Canada's 'Air Devils') travelled to Bahrain to join teams from 25 other countries in the competition. Teams enjoyed a warm welcome in the small Middle Eastern country with the royal family sponsoring the event, attending the opening and closing ceremonies and the Prince handed out the medals. The Air Devils competed in 8 rounds over three separate days and were ranked on their cumulative judged score over 8 rounds. It was a well-earned Gold Medal achievement with team personal bests and even a North American record! Hope's team competed in Poland two years ago and won bronze and were determined to earn a better result at this World Cup. Their long training weekends alternating in Toronto and Montreal certainly paid off. What a fantastic experience. Well done Hope!